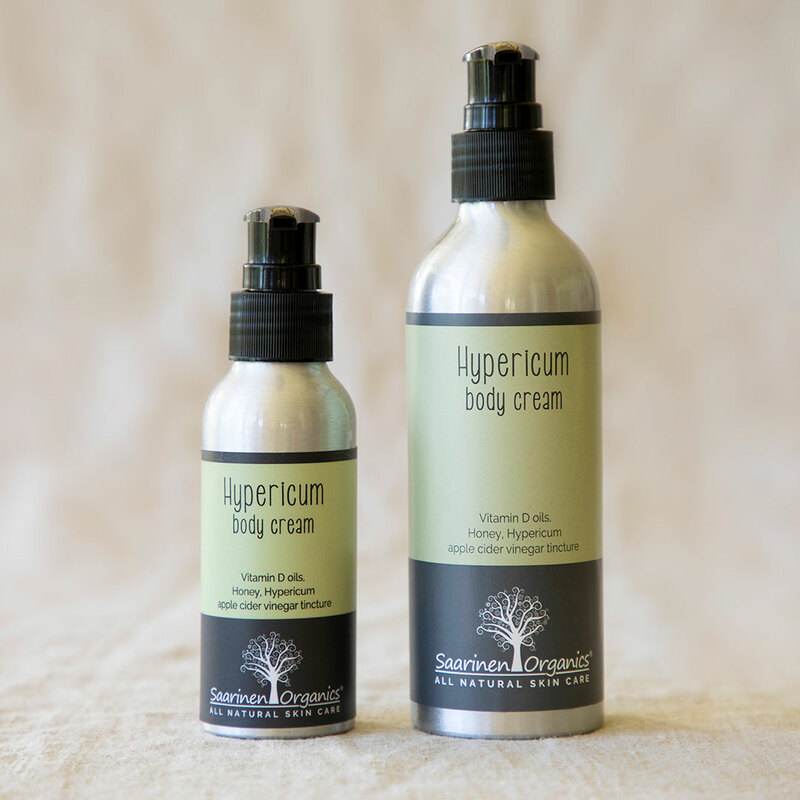 Due to very popular demand we are happy to announce we are now making our Hypericum cream in 100ml and 200ml. Most people tell us that the 150ml bottles just aren’t big enough and people also wanted a bottle for the handbag or school bag. 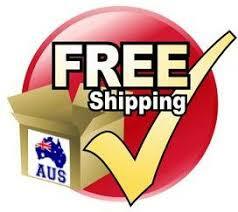 Our Hypericum cream we have had a huge success with people who have extremely dry skin that is so tight that it itches. We make it with a Apple cider vinegar tincture with the Hypericum, so it’s not for the faint hearted with a strong smell of Vinegar and earthy herbs with antibacterial essential oils, honey and of course our permaculture grown herbs infused in ionised water. 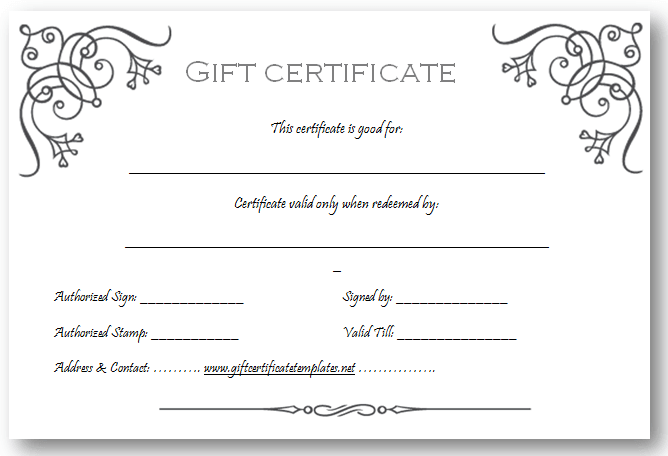 We would like to thank all our wonderful customers and give back a gift to you. We know this time of year can be expensive and we are so well supported that we would like to give a little back. If you are thinking of giving a Saarinen Organics pressie to Mum, Dad, Nan or Pop or even a teenager, we have something for everyone, with great bundles and save upto 10% with the further discount of free shipping. our Itchy skin treatment bundle. Nan would love a hand and body cream with relaxing rosalina essential oil. Pops sore hip would love a Heat rub that actually works. Teenagers a Pimples pack, to help rid of pimples over the school holidays. Thank you to all the wonderful new people i met at the Melbourne Super-show. 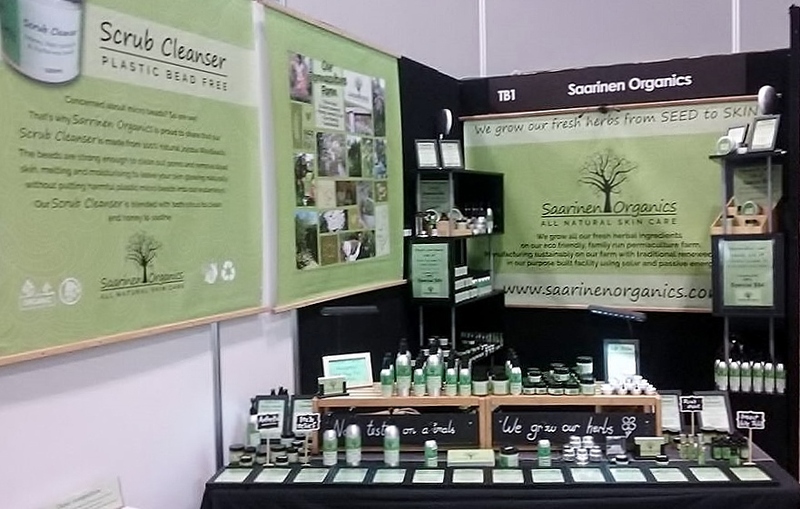 We had a competition running for the 3 days, all you had to do was pop in your email address into the competition box for your chance to win $100 worth of Saarinen organics all natural skin care. It’s a fight to the bitter end! A fight that, fair to say, all of us will face in our lifetime. The fight against aging skin. I’ve spent a great deal of time researching herbal skin care that works. I mean actually works. What kept popping up throughout my independent research was that, once we turn 35, our body starts to reduce the oil called SEBUM. And, if you thought age 35 was just the beginning, the early stages, then close your eyes. Because the process of reducing sebum oil can happen so quickly, that these oils have completely dried up by age 40. Sebum keeps fine lines at bay. A natural skin care if you will. It’s the best kind of face treatment. Research has discovered natural whole plant oils that replicate Sebum oil include Jojoba, Vitamin E, Olive Oil and Macadamia Nut Oil.  Of course they need to be sourced from certified organic or chemical-free growers and extracted under strict guidelines to preserve the Sebum oil. Our Night cream, day cream and also eye cream and nourishing serum all have the above oils in them, they are vital for a natural defense against the signs of aging. Naturally we are excreting sebum oils all day, so it is imperative to ensure you replicate the natural process. Also our scrub has Jojoba wax beads that are strong enough to clean the pores out though than they melt and moisturize for it is also important to clean the skin and remove excess oils and dirt. A natural skin care regime will leave you skin feeling and looking more youthful, slowing down the signs of ageing and premature aging, smoothing wrinkles and fine lines. If you’re going to fight the natural effects of aging, best to fight the nature with nature and replenish what you’ve lost, the natural way.